Julien Baker discusses energy and empowerment in her new collaboration with Phoebe Bridgers and Lucy Dacus. Tuesday, Nov. 20, 6:30 p.m.
Supergroups don't just appear out of thin air. Even if their music materializes out of nowhere, feeling fully formed, you can rest assured that a lot of behind-the-scenes went into said supergroup's creation. 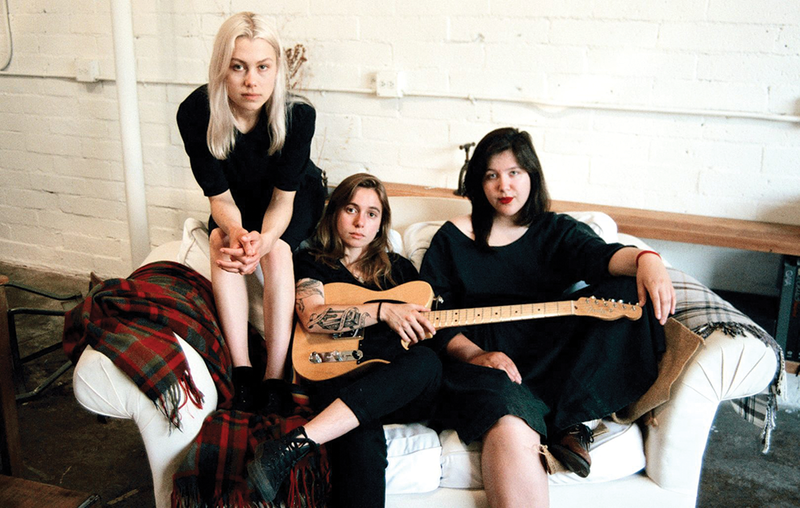 Such is the case with boygenius, the new trio featuring rising indie rock stars Julien Baker, Phoebe Bridgers and Lucy Dacus. Dedicated fans can easily spot the differences between each woman's aesthetic—Baker's raw emotion, Bridgers' folk-inflected darkness and Dacus' hard-rocking incision. But acolytes will be amazed to discover the depth of the trio's friendship and creative inspiration. All three ran into each other often in 2016-17: on festival lineups, on labels (Baker and Dacus both release their music via Matador Records) and particularly in think pieces celebrating the rise of fierce young women in rock 'n' roll. Once the three started trading emails and following each other's careers more closely, an indelible bond was formed. "Lucy and Phoebe are very empathetic," Baker says. "They feel very deeply. Their sensitivity to the world—their awareness of it—makes them such great songwriters, but what makes them great performers and artists is their motivation and vision." All three artists are under age 25, but each has released two critically acclaimed and commercially successful full-length albums and sold-out tours. Yet they still found the time this spring to get together and record boygenius, a six-song EP that highlights each woman's strengths while accentuating their collective power. "Lucy and Phoebe are both driven individuals who have very clear ideas of what they what to accomplish with their art," Baker says. "They're strong women—they know their worth—and I respect that. All of us getting together in the room was inspiring because, rather than butting heads, we got to combine our collective energies into this strength displayed by our peers." Baker says that boygenius broadened her own writing capabilities, too. Because she writes organically, letting songs "distill slowly and gradually as I go through life," experimentation can be difficult. "Writing with Lucy and Phoebe freed up some of my inhibitions about venturing into un-pioneered territory," Baker says. "Working with them showed me how much there is to gain from taking risks, instead of planning everything out exactly. I'm a very meticulous, calculated person, but harnessing the beauty of spontaneity is something I learned from this collaboration." Baker, Bridgers and Dacus have no problem writing from the heart: exposing their vulnerabilities, shattering their egos and highlighting their differences. Their current tour—which features all three musicians performing together as well as solo—finds them playing some of the biggest stages of their careers (both Bridgers' and Baker's last shows in Salt Lake City were at Kilby Court). So a sense of scope and scale is required. "That's part of the normal obstacles you're going to encounter as a performing artist," Baker laughs. "You have to show some elasticity as a performer and think about how to make songs adaptable to a new context. Personally, I love when artists change songs; I enjoy that part of live performance. As we continue on this tour, we might add amps to make it louder. We might change songs to accommodate a series of violin solos. I perform with tracks that I trigger with my feet, even though none of that is on the record." The most important part of each artist's evolution, however, has come as critics respond more to their music and less to their respective identities. Baker and Dacus both hail from religious Southern upbringings and identify as queer; a disproportionate amount of Bridgers' early press focused on her professional and personal relationship with alt-country icon Ryan Adams. But Baker says she's happy to embrace her role as a trailblazer. "I've been torn about that basically the entire time I've been a musician," she says. "The fact that I've struggled with substance abuse and mental-health issues, or the fact that I'm queer, or the fact that I'm a person of faith, those are all things that I want to be open and candid about. If it contributes to the visibility or representation of the queer community, or if it makes another person feel less alone to identify with an artist in that way, then it is worth it to divulge that part of my personal life." Baker admits that she's pleased by the recent turn toward critical assessments of her music. But she's also adamant that context matters—in art, in history, in politics and in life. Hinting at the fact that other artists (perhaps Bridgers and Dacus, perhaps not) have mixed feelings about being mischaracterized, she flashes the humanistic qualities that make her such a compelling voice in today's crowded musical landscape: "Categorization is the first compulsion of human beings to make sense of our world," she says. "Insofar as my categorization can be beneficial to other people who have been placed in this group with me, that's a tool I can be grateful instead of resentful for."